54 in. 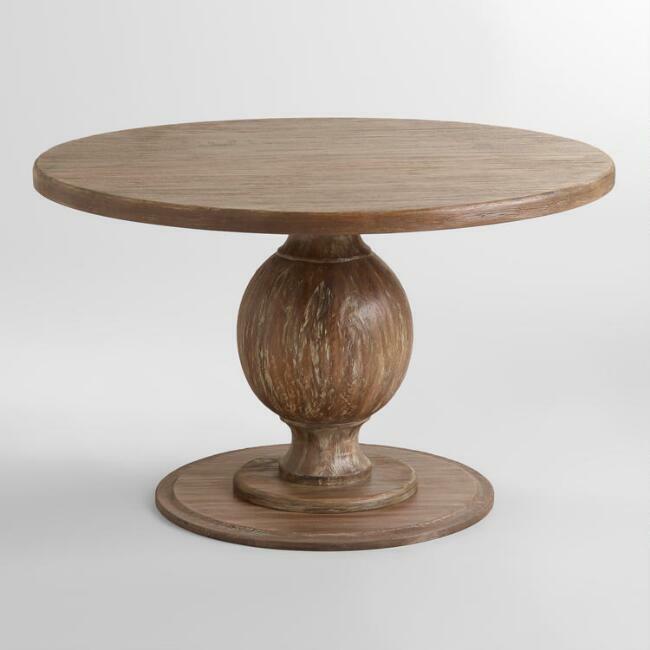 round dining table with leaf. Approx. $799. But then I realized why it was so challenging — and I’m guessing you can relate since you’re reading this article. First, there are so many round tables on the market it’s mind-boggling. Second, it’s definitely one of the most important pieces of furniture in my house. The kitchen table I choose really matters. More often that not, it’s the place where my family, guests, and I spend the most time chatting. Hanging out in the kitchen is cozy. It makes people feel welcome. And there’s something extra welcoming about round tables. I swear, my kitchen table gets more visitors than my living room sofa! I think these have a more sculptural look and can really add a focal point to your kitchen. I also love the fact that everyone can easily fit their legs under it. 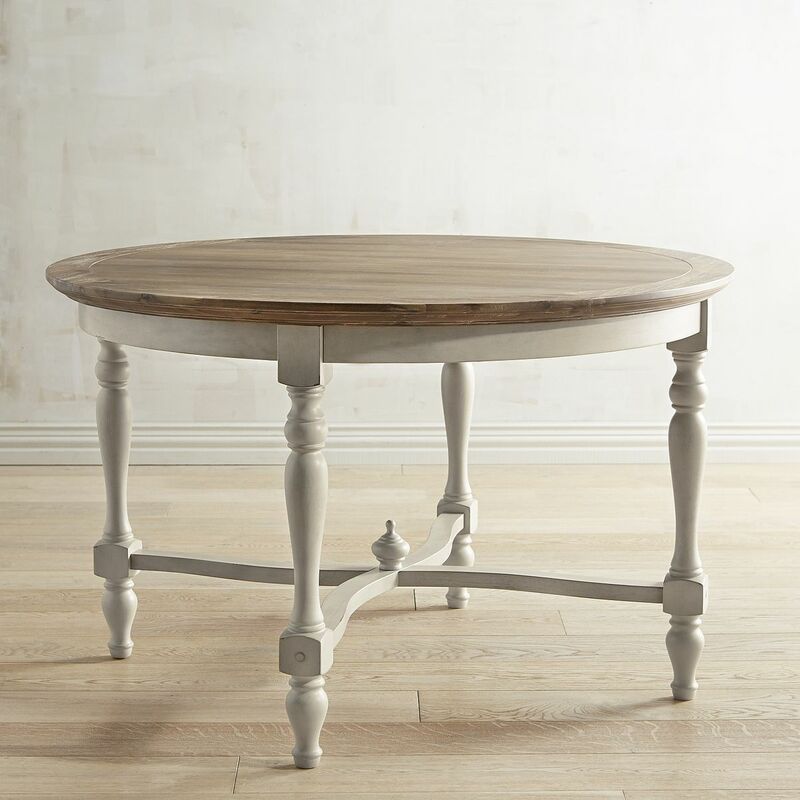 This 48-inch table could go in a more traditional or transitional room. You could also dress it up with very contemporary chairs if that’s your look. It’s approx. $440. 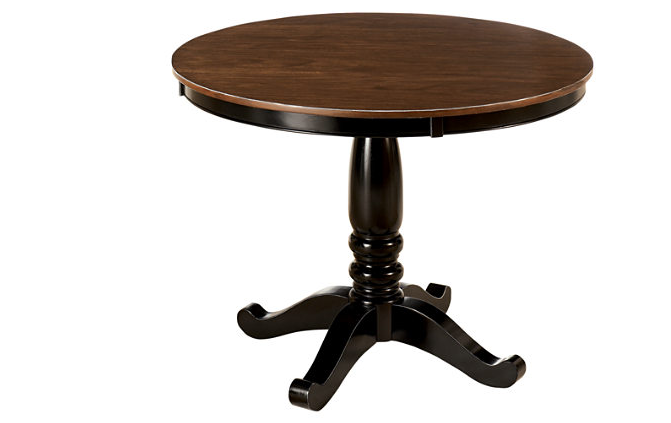 Here’s a similar round dining table that’s 53 inches, and is made of solid mango wood with an antique walnut finish. It costs approx. $699. 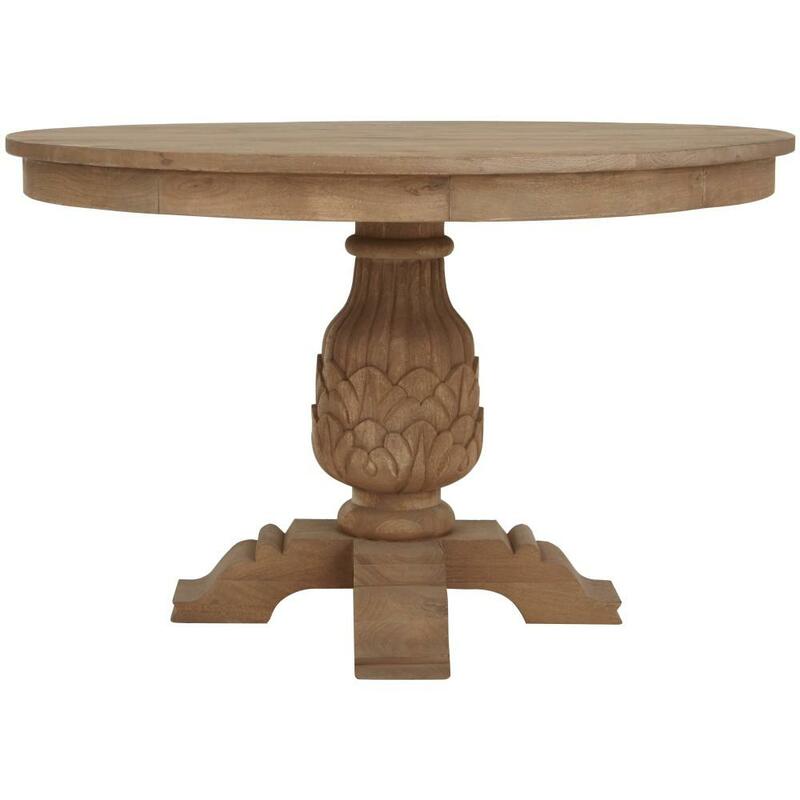 Here’s another pretty table with its elaborately carved pedestal. It’s made of solid mango wood with a sandblasted antique finish. The base looks like a pineapple, which is an ancient symbol of welcome. It costs approx. $799. You can find out more about it here. 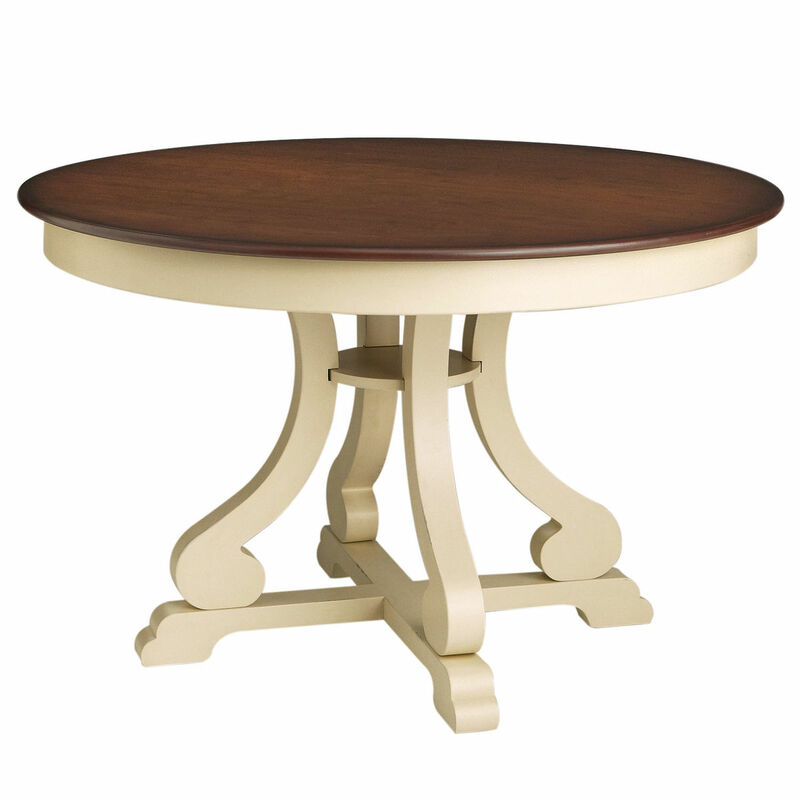 This table is a very traditional style, with the two-tone finish. You can find this in a wide price range based on the materials used. This 42-inch table approx. $250 and is made of wood, manmade wood, and veneer. This table is interesting. It’s 47.6 inches and costs $499. It’s made of plywood, MDF, and veneer — you’d never know from looking at it! 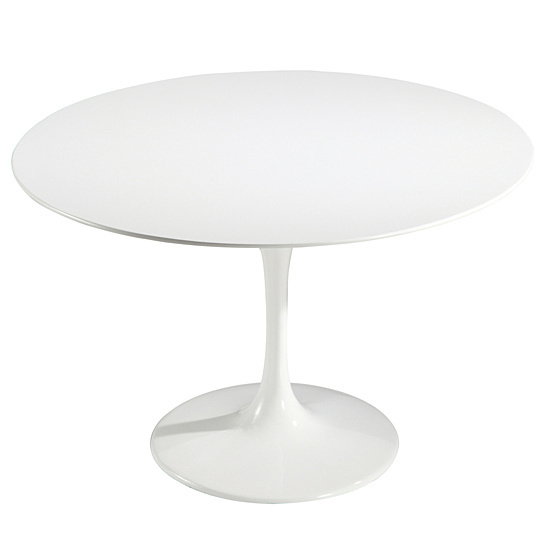 A modern-looking version of the pedestal base looks more like this table made of white fiberglass. It’s reminiscent of the famous Tulip Table by Eero Saarinen from the 1950s. It costs approx. $250. It’s often more traditional-looking than a pedestal base and it has a lighter look. But if the legs are highly sculptural, they can add a lot of whimsy and decoration. I love this 48-inch table with a natural stonewash finish. It costs approx. $499. Again, I think these look quite sculptural. 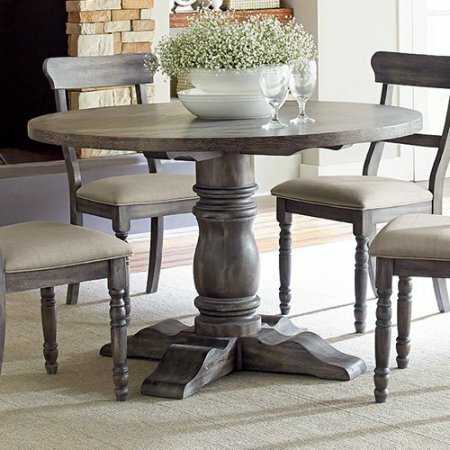 They’re often described as “farmhouse” style, but on a round table these legs can make it look pretty modern. Great for people who like “transitional” style. And here’s another! 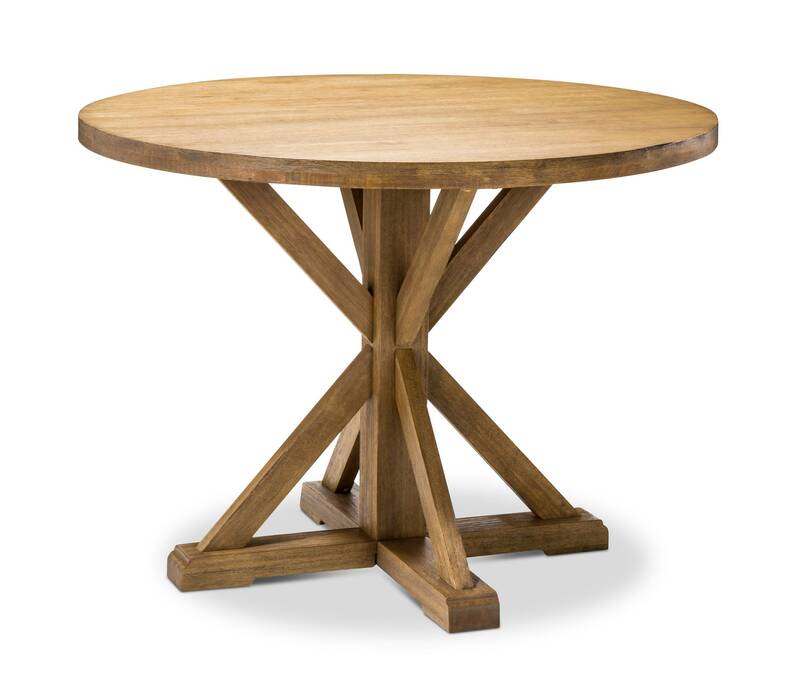 This solid hardwood table has oak veneer and a washed linen finish. It’s 48 inches, but has a leaf that extends it to 54 inches. Approx. cost $799 (chairs not included). 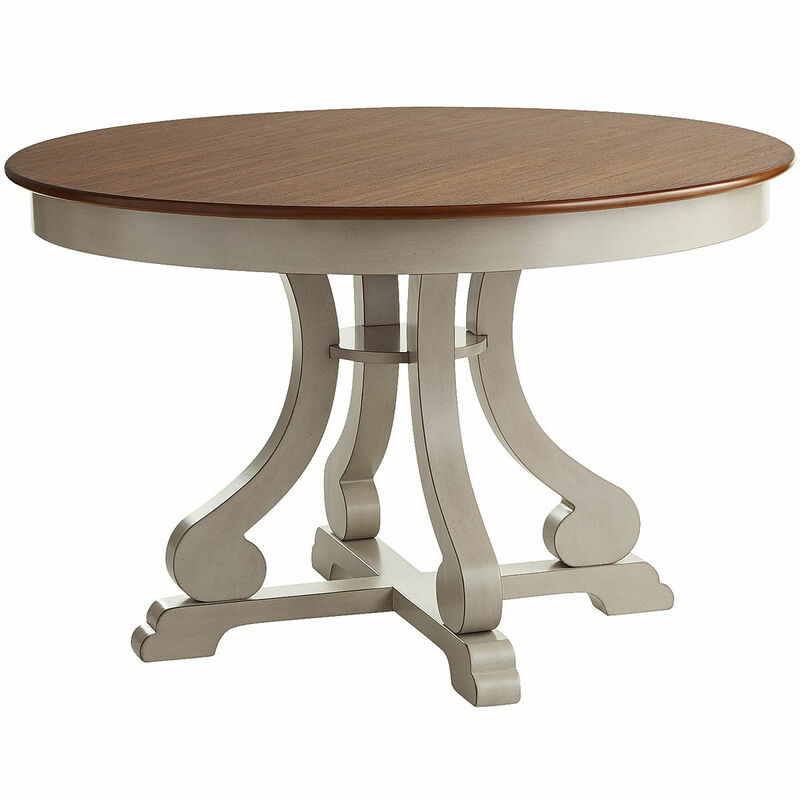 The price range on round dining tables is vast, from under $100 to over $1,000. Based on my research, the dividing line seems to be at around $500. Many cost less than that. After you hit the $500 mark, prices often jump to $800. 72 inch (seats 7 to 8 people). Keep in mind when you’re measuring that you need to consider the amount of space around the table. At the very least you need to plan on 36 inches between the wall and the table edge, to allow people to push their chairs back. But, 42 to 48 inches is even more comfortable. You got the full range of materials here, from solid wood and engineered wood, to plastic, stone, iron, and more. In some cases the table top matches the legs, but not always. Ask yourself before you buy: Do the table materials go well with my floor? Try to imagine the table sitting on top of it, as if you’re seeing it from across the room. 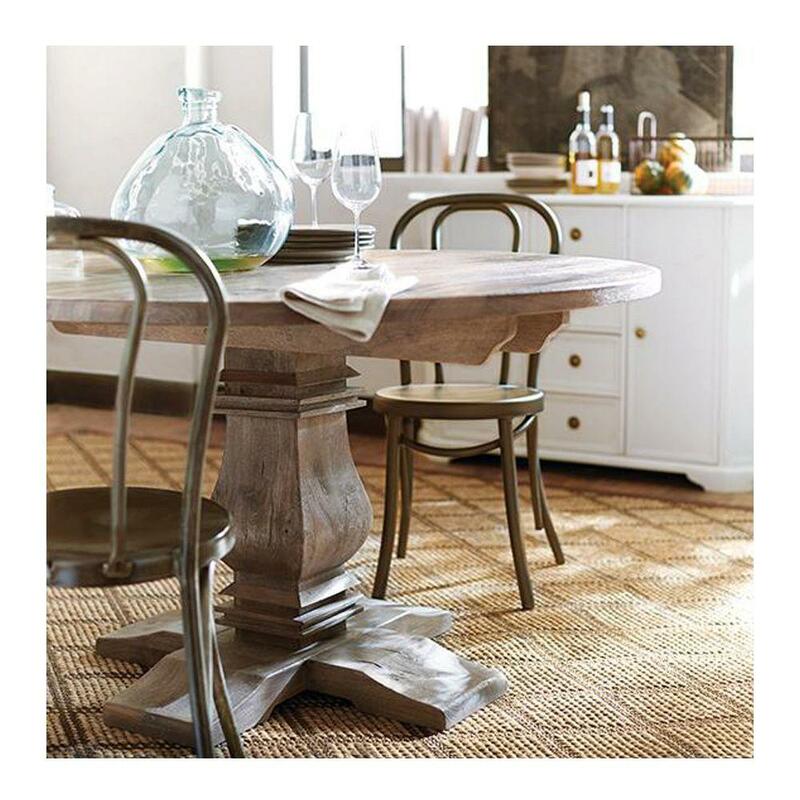 Are you placing the table on tile, stone, wood, a rug, or carpet? Also, think about how the colors will look against each other. If you have a dark floor and a dark table, they’ll blend together if you don’t add a rug. If you like higher contrast than that, you may want to get a lighter table. 5. Do you need a matching set? I like mixing and matching tables with chairs, to create a slightly more eclectic look. But lots of people prefer to buy a matching set. I don’t think there’s a right or wrong to this; it’s just a matter of your own style. 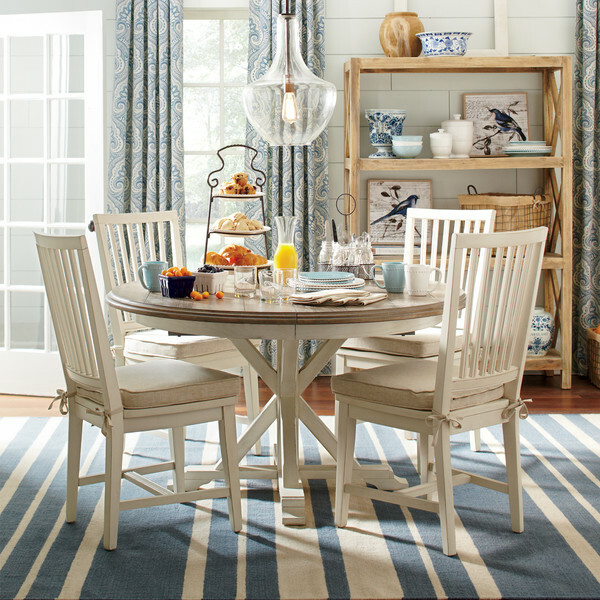 But if you do want a matching set, then you have to take a good look at the chairs when you’re considering the table. Will the chairs look good with your other furniture? And that’s pretty much it. Of course, if you’re looking for an antique table there are other things to consider, such as the age and provenance. But for newly-made tables, focusing in on these variables should help you narrow down the choices. Got questions about round kitchen tables? Leave a question below and I’ll find the answer!